Custom Music Planners with you to get to now your music & entertainment preferences. Most event DJ's now-a-days use online planning tools, however we have found that these online tools are to generic & do not cover all the fine details needed to properly DJ & Emcee your wedding, and most times these tools are confusing for some clients to complete. On top of that, using the online tools does not give us the opportunity to really get to know you or your entertainment needs. So we rely on our Custom Music Planners to effectively go over all necessary details that we feel we need to properly DJ & Emcee your wedding. 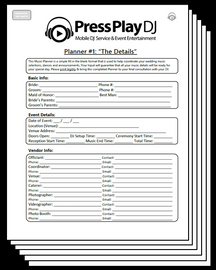 Below is a brief description of what each Custom Music Planner was created to assist you with. If you have any questions about our Custom Music Planners, feel free to contact us. This Custom Music Planner is a very detailed form that you will fill out with all the songs, cues and particulars you want at your wedding ceremony & reception. It covers all the formal dances that are commonly played at most weddings (first dance, parent's dances, bouquet & garter toss, etc.) as well as extra spotlights dances that we like to play to add a more entertaining events at your wedding. These include the "Money Dance," "Anniversary Dance," "Shoe Game," and more. This Planner also covers details about song cues as well as all announcements that you want us to Emcee at your wedding. Completing this Planner help you organize the dances & activities for your wedding and will guarantee that all song requests and announcements will be ready for your wedding. 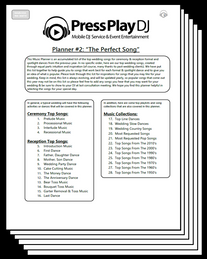 This Custom Music Planner is an accumulated list of the top wedding songs for ceremony & reception formal and spotlight dances from the previous year. This Planner will describe each formal & spotlights song "meaning"; ex: the Prelude song is the song played prior to the ceremony, while guests are arriving; and used to signify the start of ceremony so that guests begin to take their seats. This Planner will also help guide you to songs that work best for each formal & spotlight dance (first dance, father-daughter, cake cutting, etc.). You don't want to play a slow love song made for a couple for the mother-son song. Our Custom Music Planners are available in Print & Digital Download Formats for your convenience. Our Digital formats are compatible with Apple & Android devices for viewing on your phones, tablets & other smart devices.